I was super stoked to prepare the recipes in the 30th episode of Good Eats. Why, you ask? Though I do love quiche and flan as much as the next girl, I was most excited to make these recipes because I got to use our brand new range for the first time. 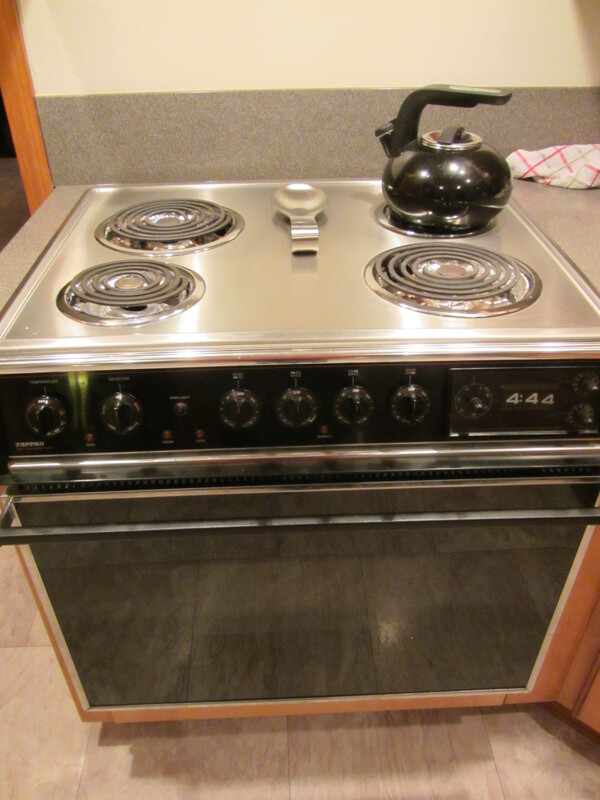 When we moved into our house, we were greeted with the original, 25-year-old, drop-in Tappan range (I had never even heard of the brand before!). I cook often enough that a range with roll-over numbers (stuck permanently at 4:44), a broken burner, and an oven door that would not shut just was not going to cut it. The old range. You can’t tell in this photo, but the oven light is permanently on since the door won’t shut. 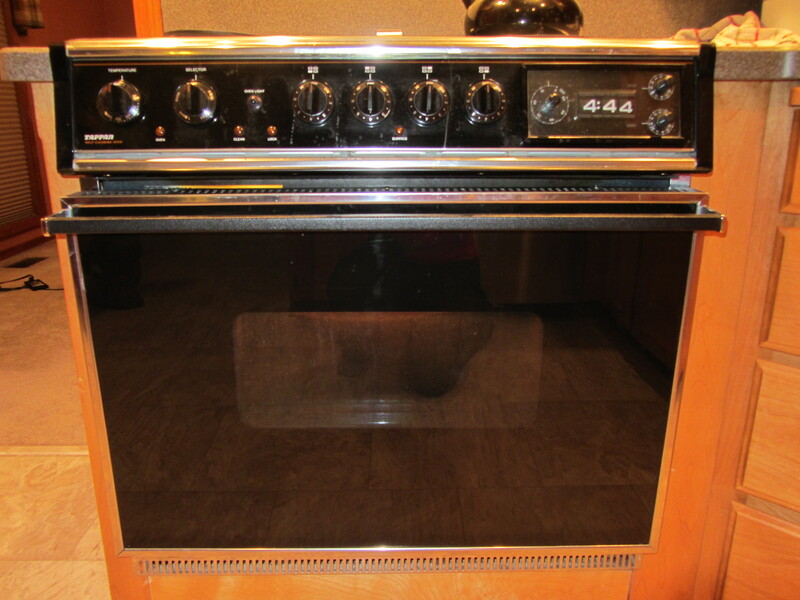 Old range with a broken front burner. Ta-da! 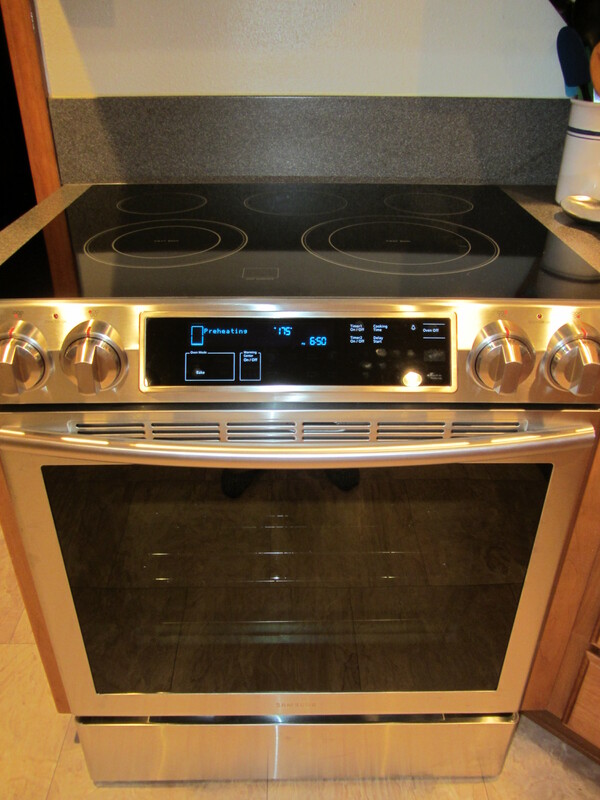 Enter our new smooth top Samsung electric range. We considered putting in gas, but the venting, etc. just wasn’t going to be feasible, and we would have lost cabinet space. So far, we are loving our range! 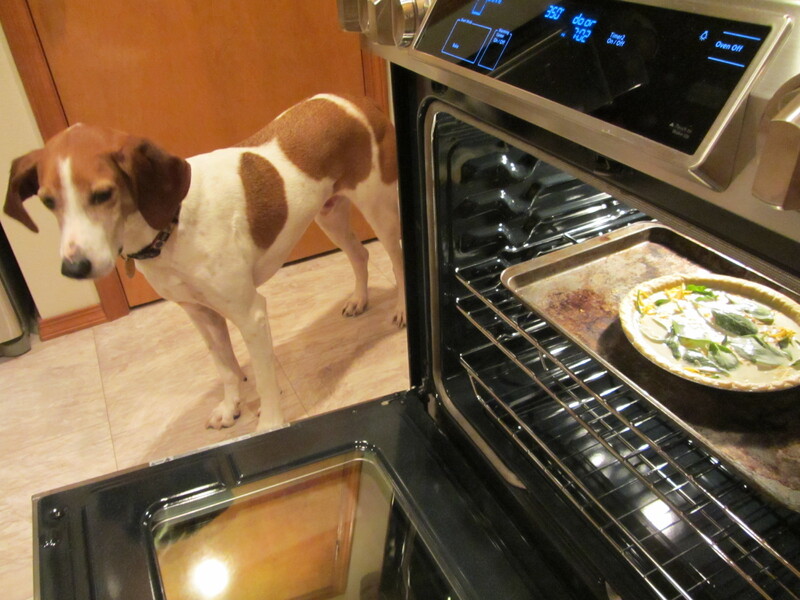 The very first thing I cooked in our new oven was Alton’s recipe for Refrigerator Pie, AKA quiche. 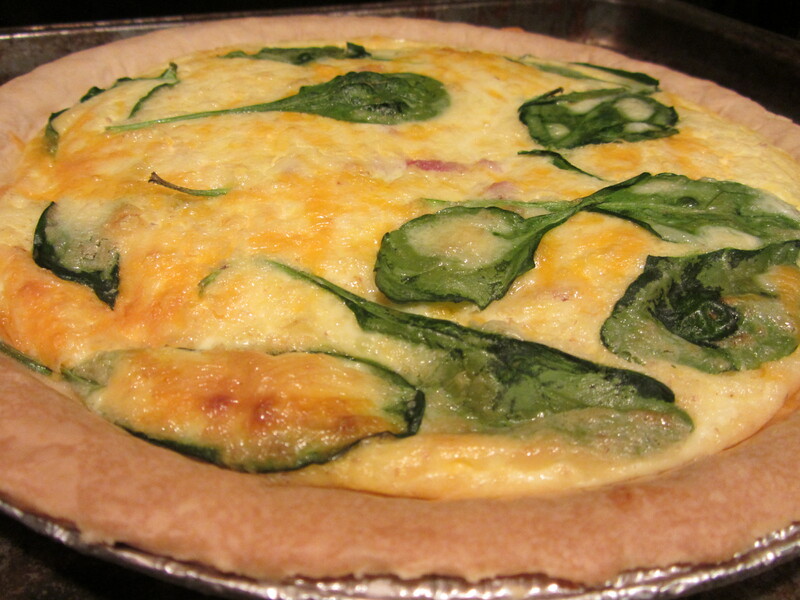 I had my share of quiche growing up, as it was something my mom made on a fairly regular basis. 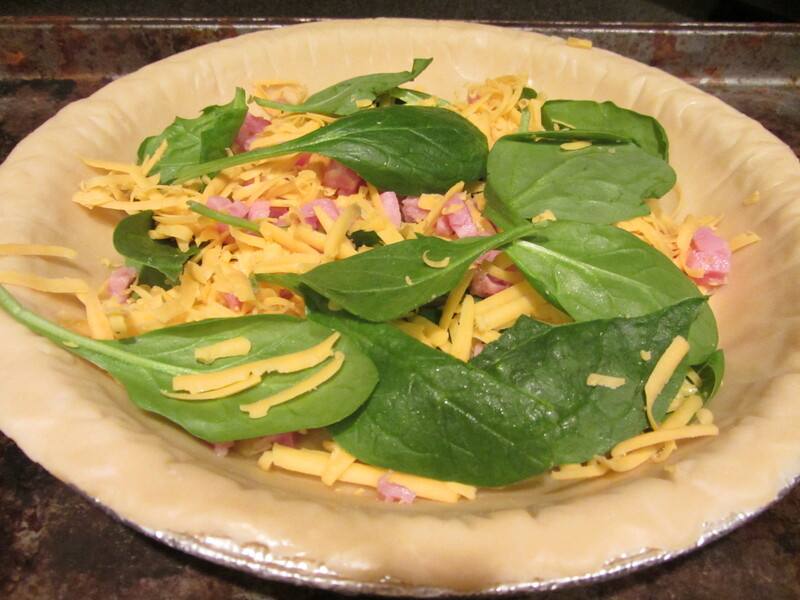 Alton’s version is particularly easy, in that it uses a frozen crust. 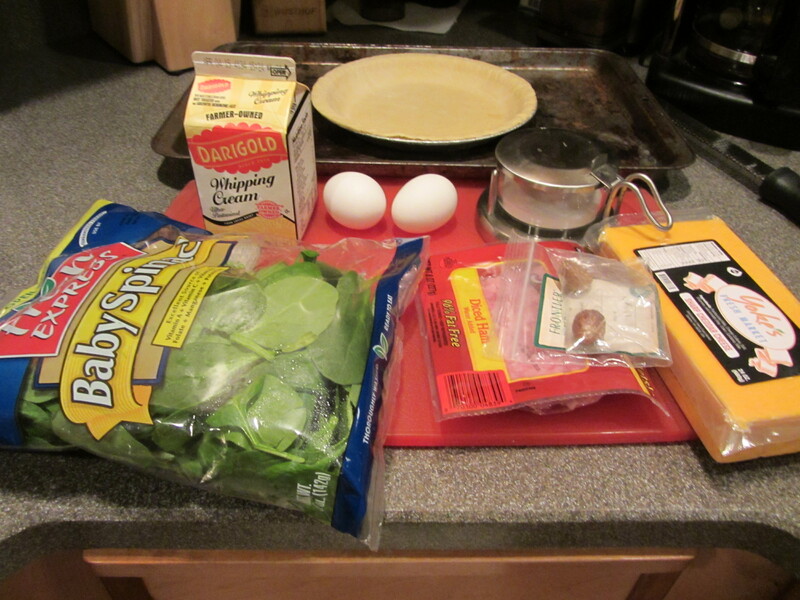 Ingredients: frozen pie crust, spinach, cream, eggs, cheddar, cubed ham, Kosher salt, nutmeg. To start the recipe, you whisk a cup of cream with two eggs (this is called “Royale”) and you place your frozen crust on a baking sheet (to avoid any spills in the oven). 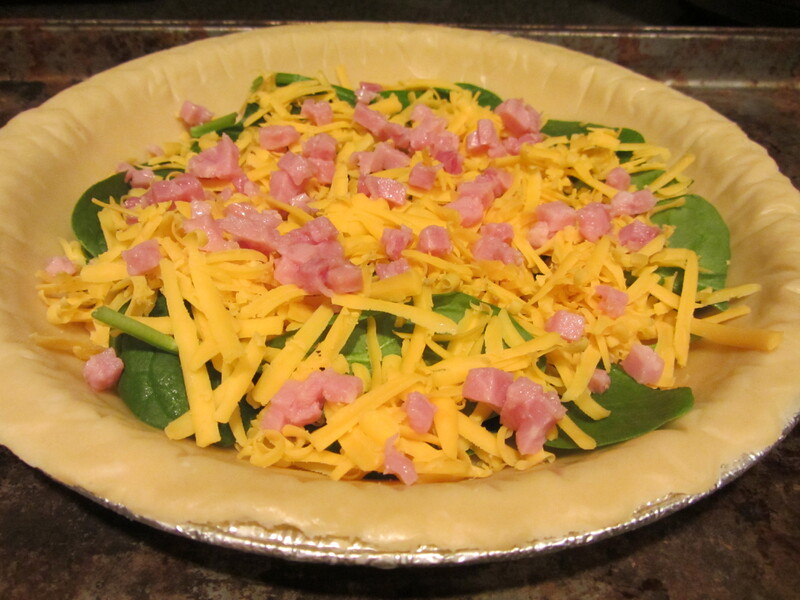 You sprinkle your choice of toppings over the crust, mixing them with your hands; I opted for spinach, shredded cheddar, and cubed ham since that is what Alton did in the episode. To your Royale, add a couple pinches of Kosher salt and a few grates of fresh nutmeg. My whole nutmeg seed decided to take a dive into my Royale, which necessitated fishing it out. Butter fingers! Nutmeg and salt added to Royale. Pour your Royale over your ingredients. The egg will expand when it cooks, so you do not want to fill your crust all the way to the top; I had the perfect amount of liquid for my crust. Bake your pie in a 350 degree oven for 35-45 minutes, or until it is set like Jell-O and no liquid comes out if you poke a small hole with a toothpick. My quiche was done in 37 minutes. Great filling, but needs a better crust! You do not want to overcook this. 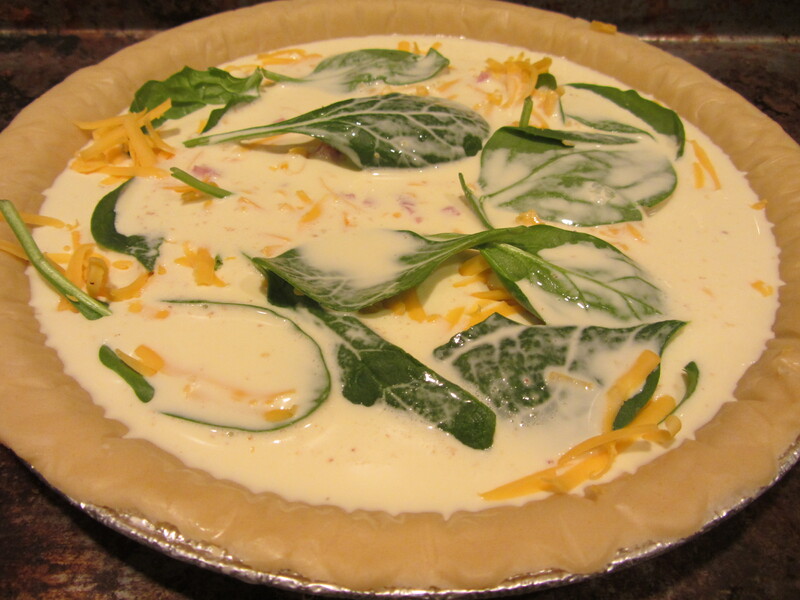 Ideally, allow the quiche to cool for about 15 minutes before eating. 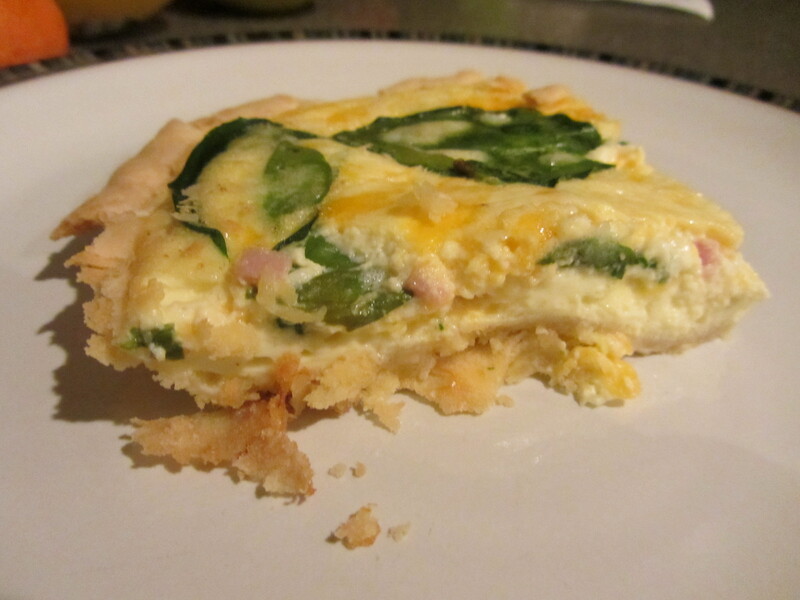 The filling on this quiche was the best I have ever had because it was so much lighter and fluffier than any other quiche I have had. We liked it so much that Ted made one for breakfast a few days later. My one complaint was about the crust, as it wasn’t as crispy as I would have liked. Alton did not mention pre-baking the crust, so I did not pre-bake mine either, and it seemed a little doughy. 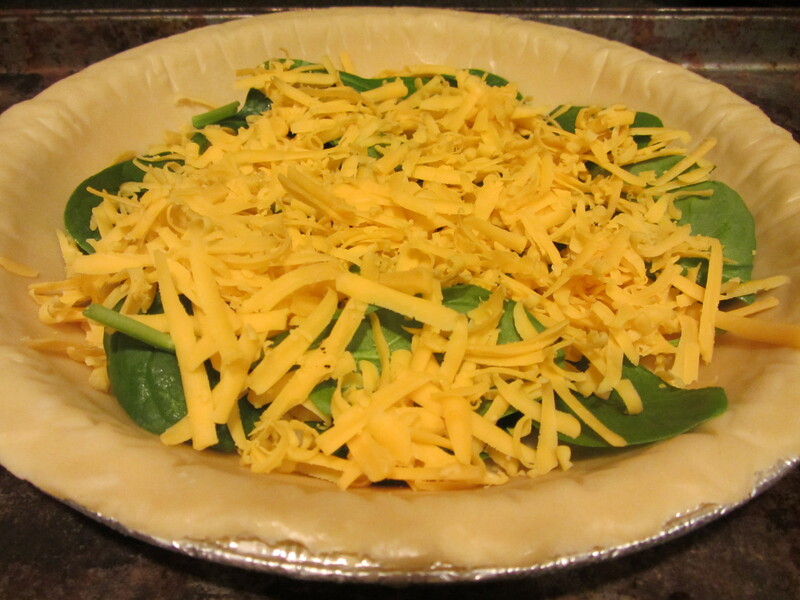 When Ted made his quiche, he did pre-bake it, but it was not significantly crispier. 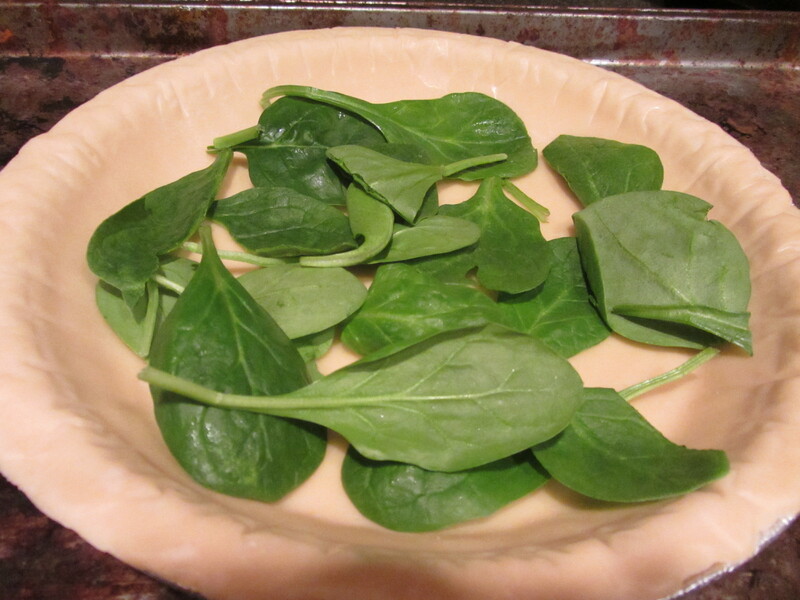 I did buy a generic brand of pie crust, so maybe a different brand would yield better results. Seeing as we will be making this again for sure, I will have to play with different crusts. The filling, though, is already a winner. I foresee that we will be making this when our refrigerator is poorly stocked but we still want to eat something good! Seriously, best quiche filling ever. And what was the second thing I made with our new range? Alton’s flan, of course. For some reason, my only childhood association with flan is of an unpleasantly jiggly, overly gelatinized, dessert served at bad Mexican restaurants. I have a distinct memory of my family going to a Mexican restaurant with another family, and at the end of the meal the other family got super excited to order flan. I had no idea what flan was, but their enthusiasm made me think I SHOULD know what flan was, so I feigned excitement and ordered a flan. I should have gone with the churros. 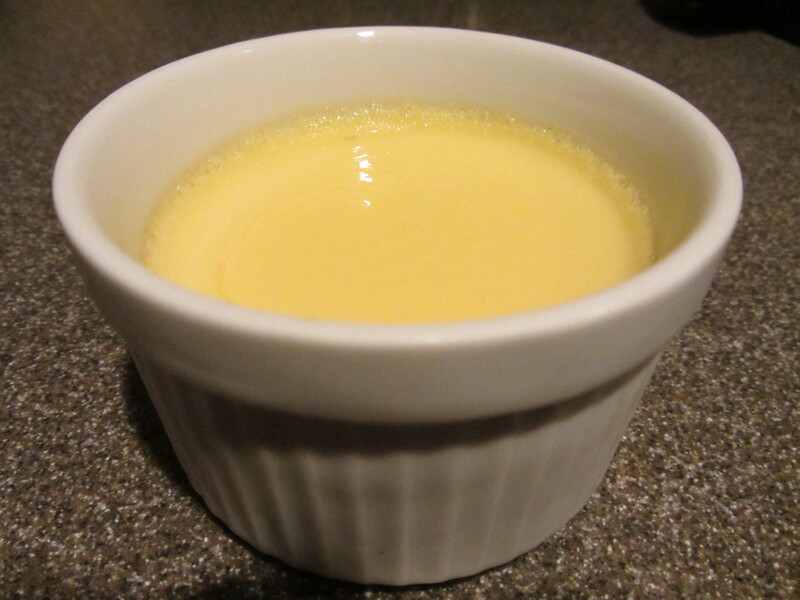 Creme brulee has since been my custard of choice. Still, I was excited to make Alton’s flan, as I figured that pretty much everything Alton made on Good Eats was fantastic, so this was likely to be my best opportunity to have, and make, a good flan. 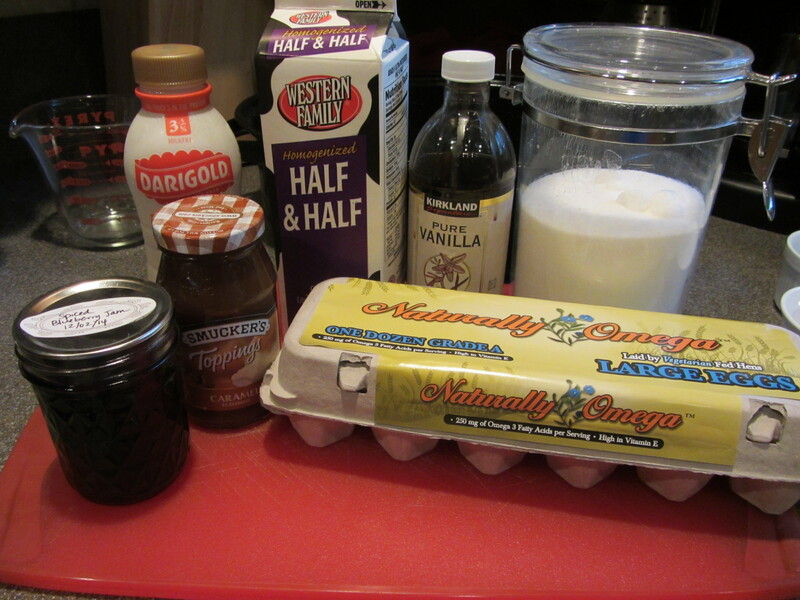 Flan ingredients: whole milk, half and half, vanilla, sugar, eggs, blueberry jam, and fat-free (doh!) caramel. 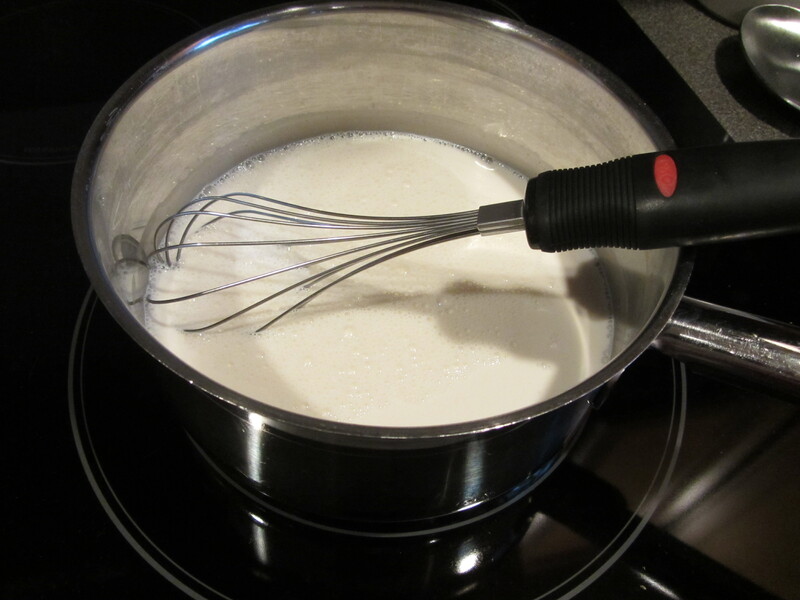 For this recipe, combine whole milk, half and half, sugar, and vanilla in a saucepan over medium heat at a bare simmer. 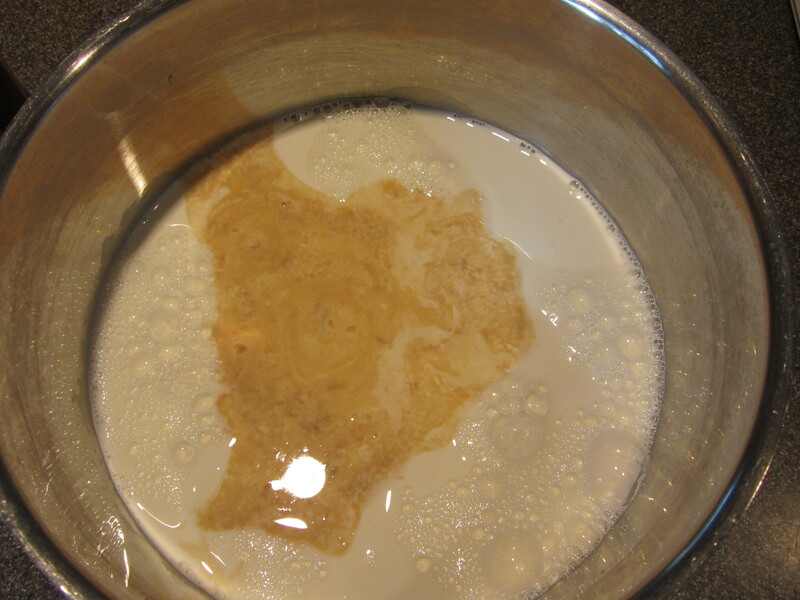 Whole milk, half and half, sugar, and vanilla in a saucepan. 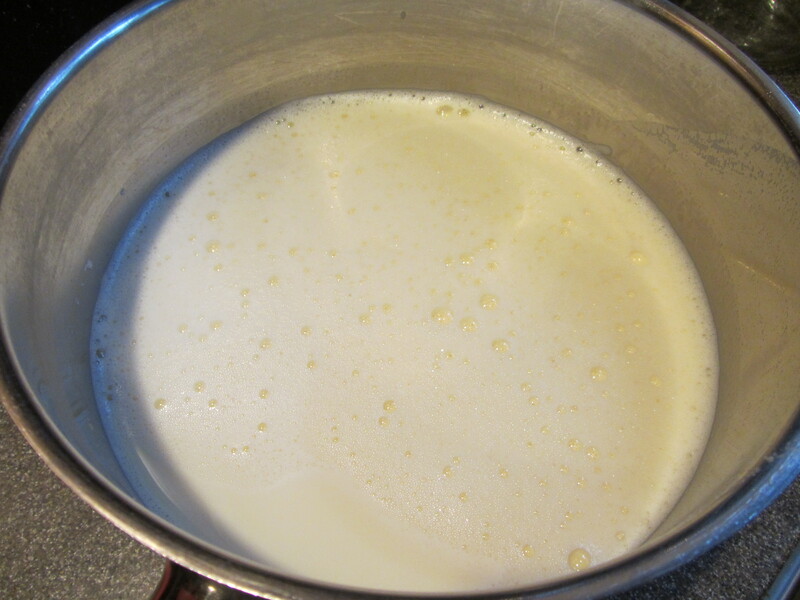 Milk mixture at a bare simmer. 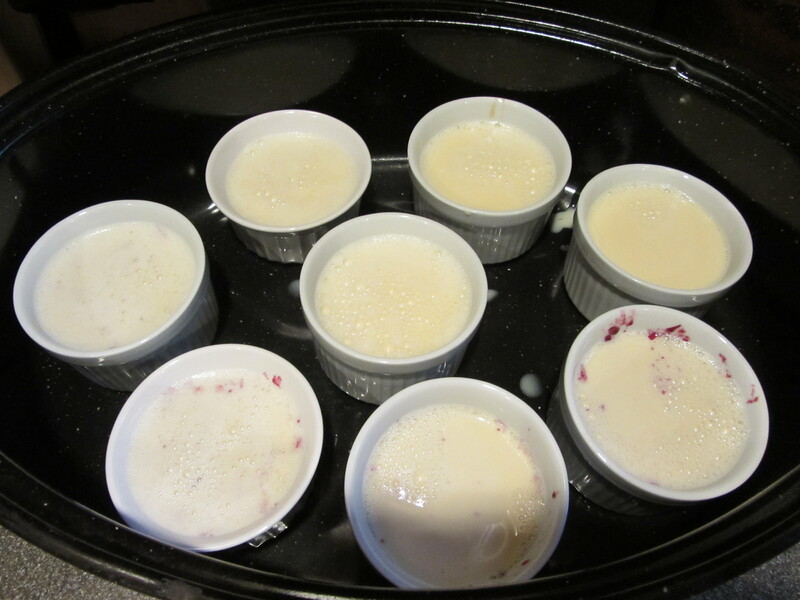 Meanwhile, add 1-2 T of your chosen topping(s) to eight ramekins, and place them in a roasting pan that allows an inch between them. 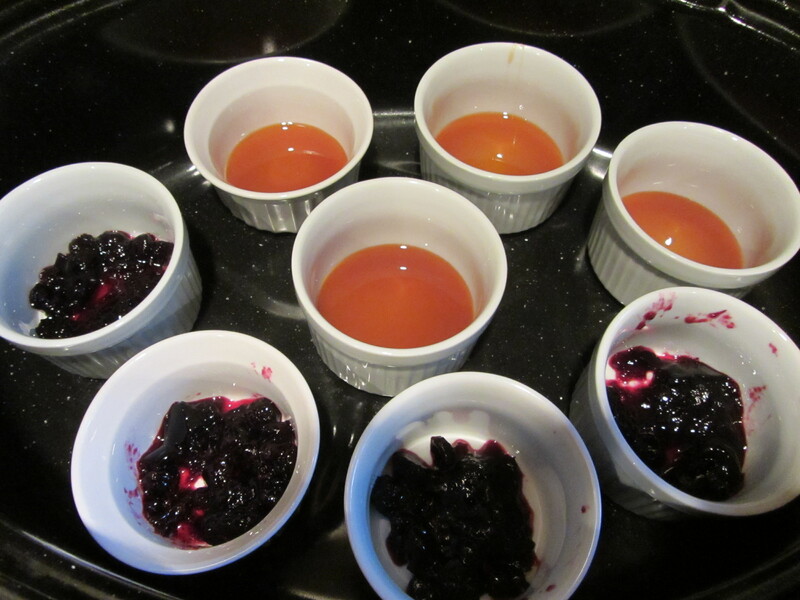 Caramel and blueberry jam in ramekins. For my toppings, I chose caramel ice cream topping and Alton’s blueberry jam I wrote about here. Unfortunately, I made the horrible error of accidentally purchasing fat-free caramel. Yuck! I did not have time to make a homemade caramel, so I had to go with the fat-free junk and hope for the best. In retrospect, I probably should have opted for plain flan. 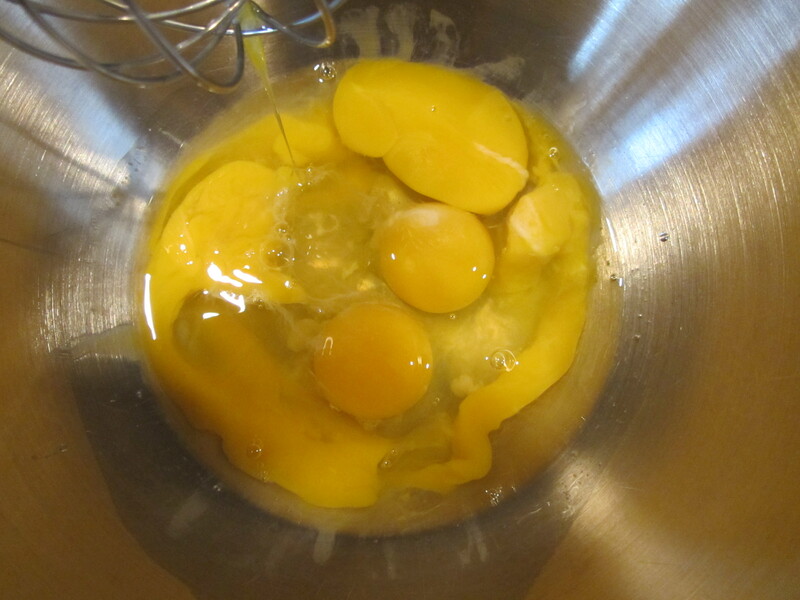 In a bowl, whisk three eggs and three egg yolks until they are thick and light. Three eggs and three yolks. Eggs and yolks whipped until light and thickened. 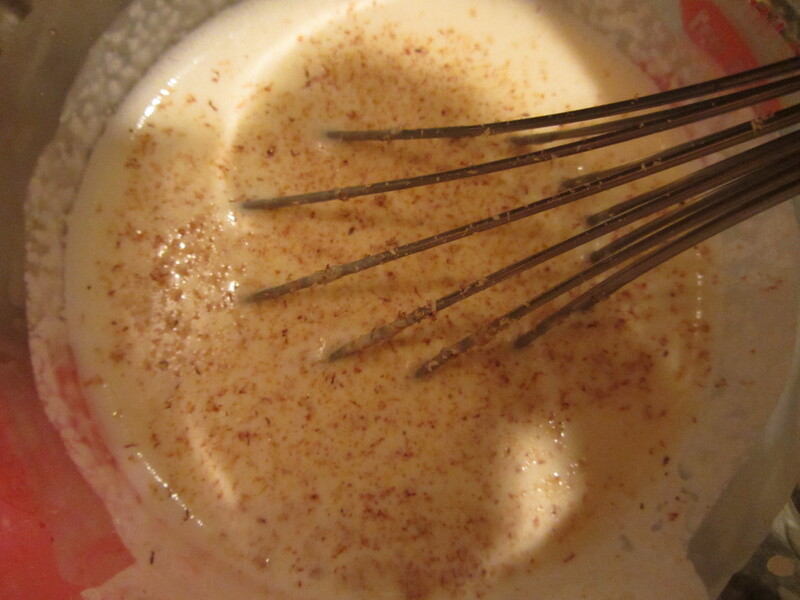 Slowly drizzle about a quarter of the cream mixture into the eggs, whisking. The key here is to go slowly. 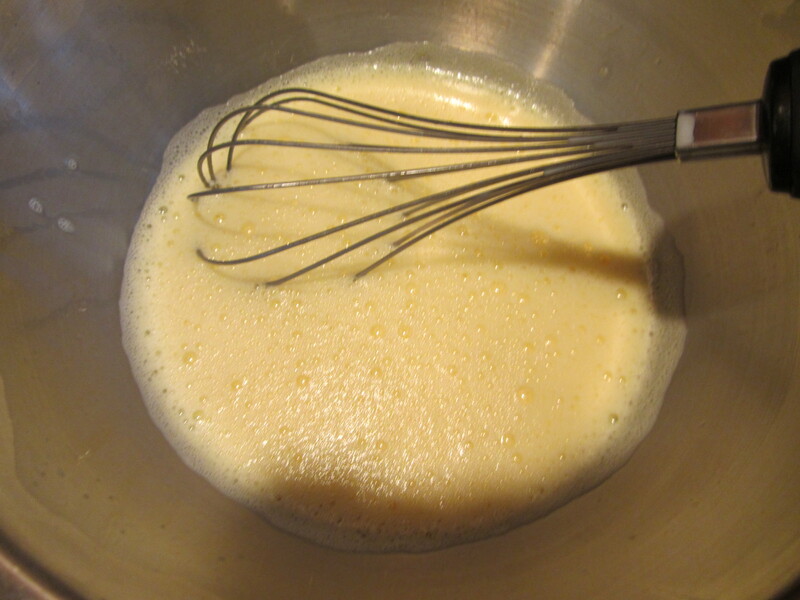 Once the eggs are tempered, add the egg mixture back to the cream, whisking again. 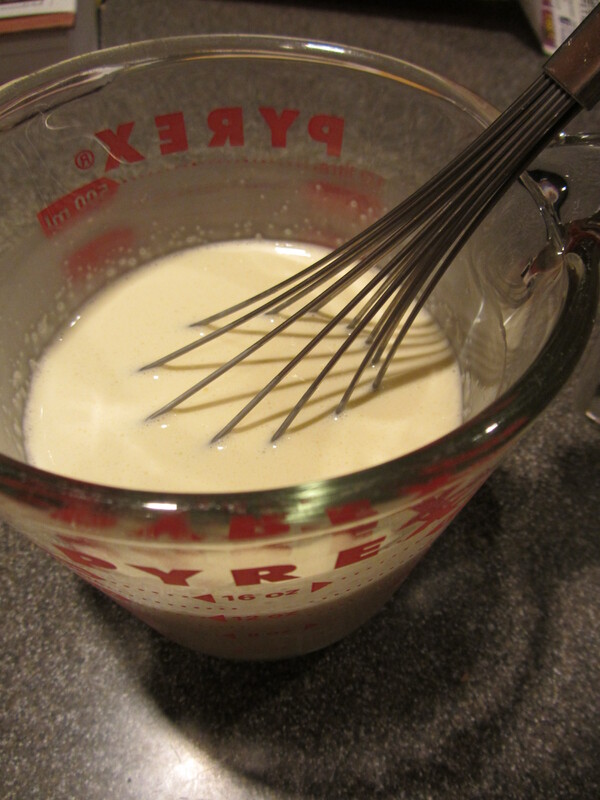 Tempered egg mixture added back to milk mixture. 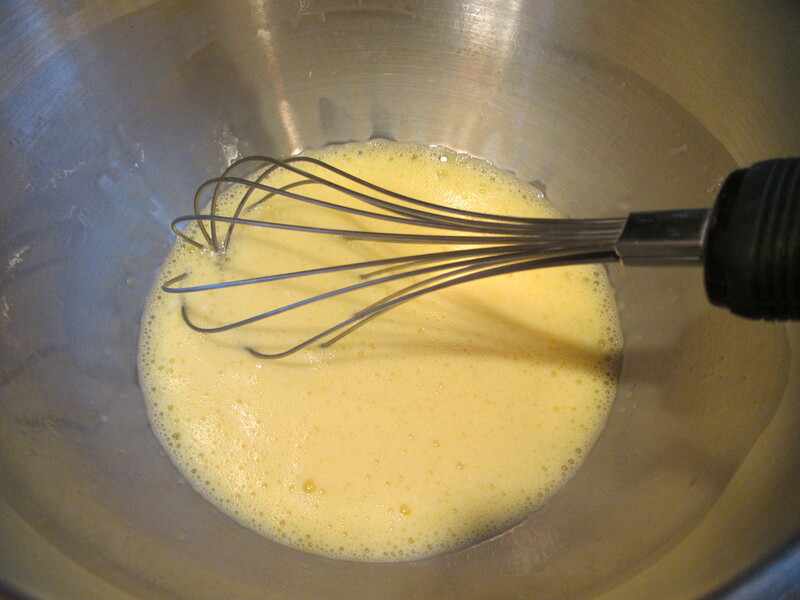 Strain the custard to get rid of any curdled egg or any chalazae (the tough “strings” in eggs that keep the yolks suspended). 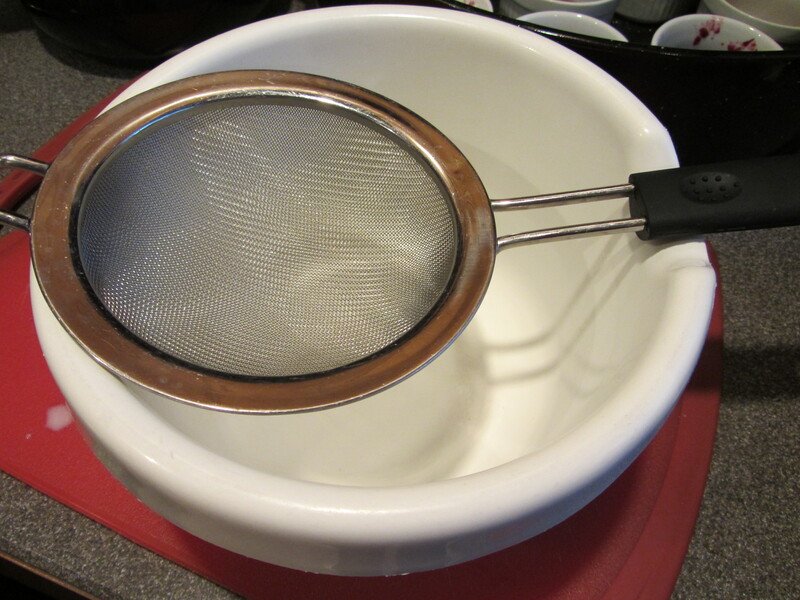 Strainer to remove any lumps. 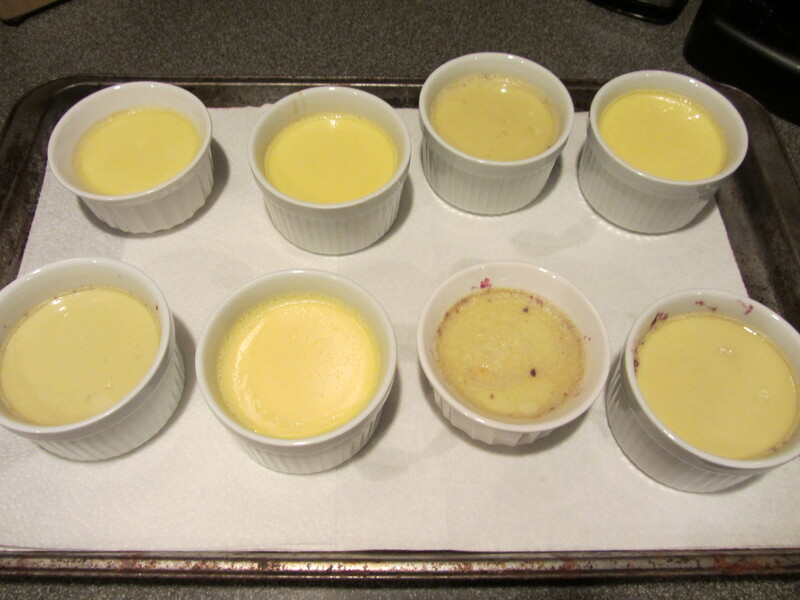 Pour the custard into the ramekins and place the roasting pan in the middle of a 350 degree oven. 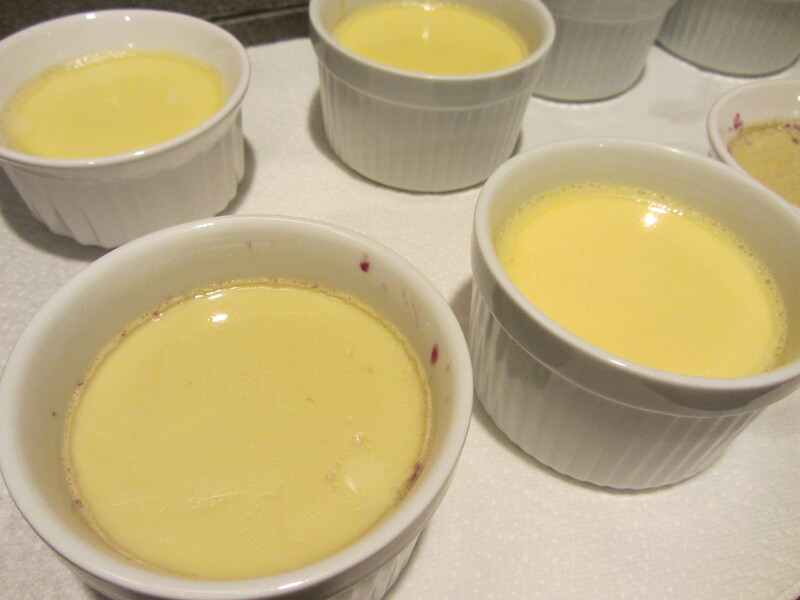 Custard in ramekins. I wonder which ones are blueberry? So much for mystery. 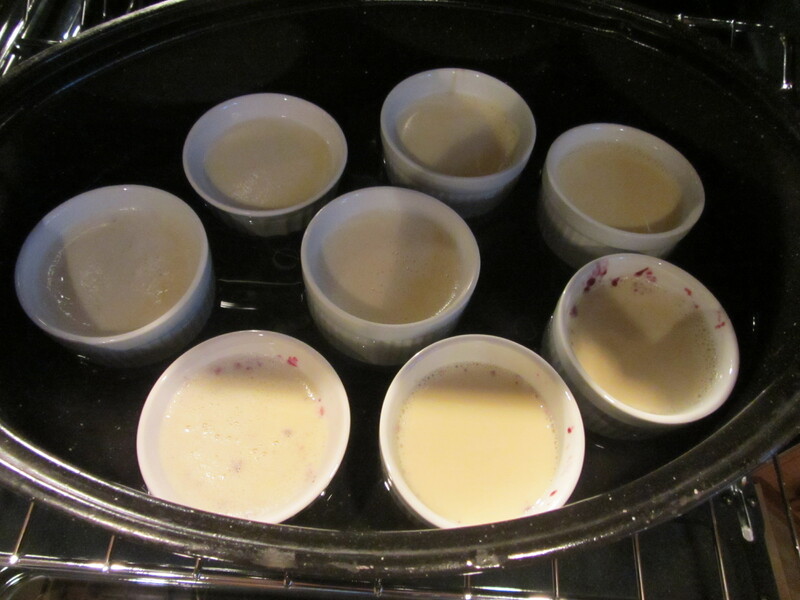 Pour boiling water into the roasting pan, bringing it up almost to the level of the custard in the ramekins. 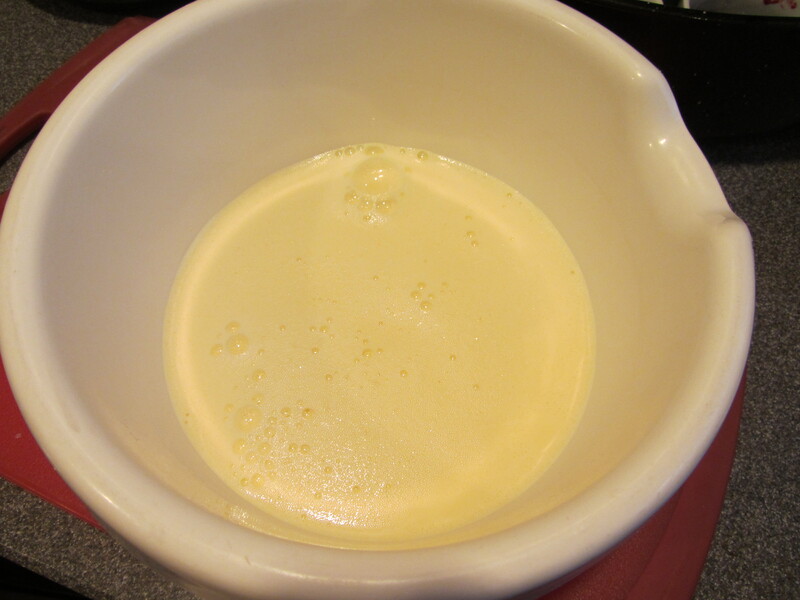 Water up to almost custard level. Bake for 25-40 minutes. Alton explains in the episode that the slower you cook the custard, the lower its setting temperature will be. My flans were done right at 40 minutes. They are done when they wobble and a pairing knife comes out cleanly. Remove them from the water bath with tongs, allow them to cool to room temperature, wrap them tightly with plastic wrap, and refrigerate them. 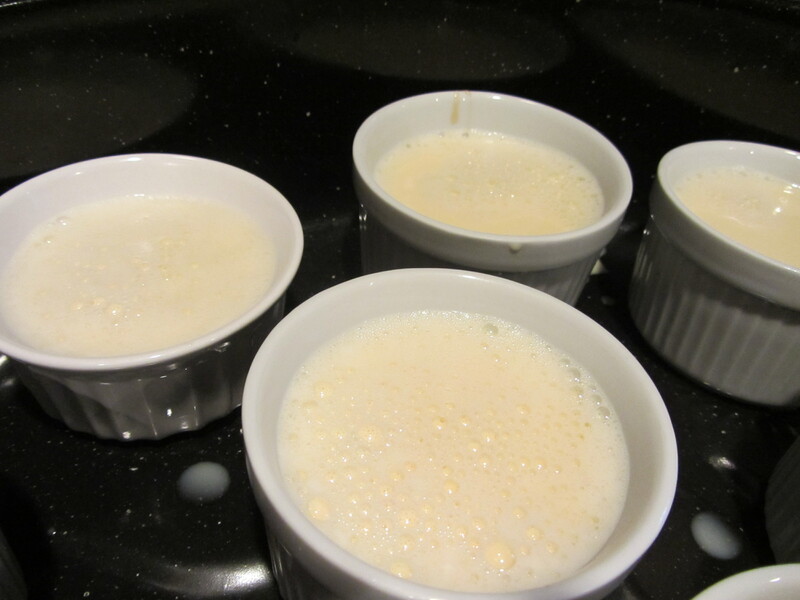 Flans after 40 minutes in the oven. 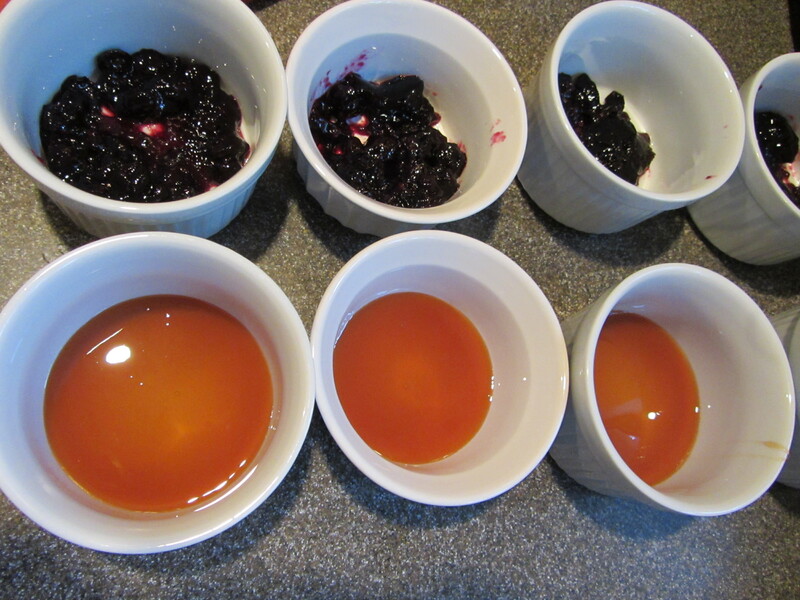 When ready to serve, you can eat them straight from the ramekins, or you can run a pairing knife around the outside and invert them onto a plate. We ate the flans for dessert, and shared a couple with my parents. The caramel topping was indeed unfortunate, but the custard was really good. 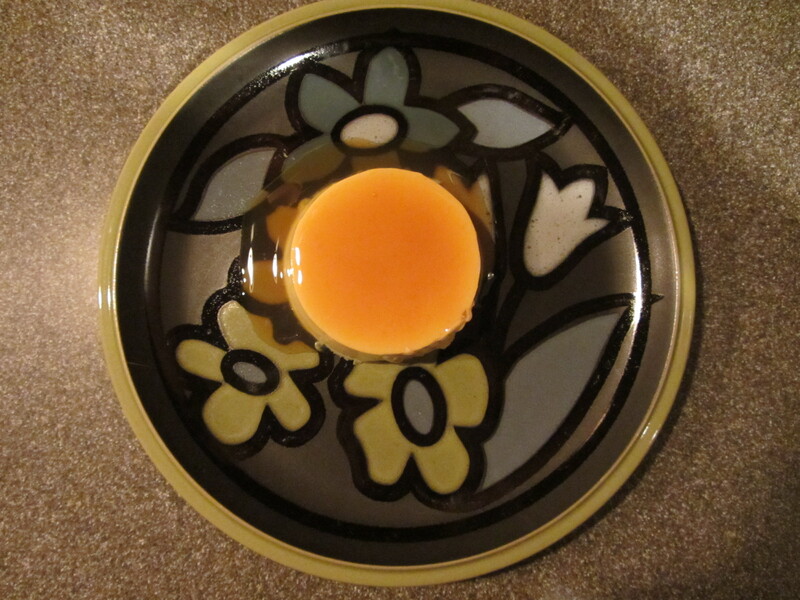 The only flan I have had previously has had caramel topping, so the blueberry topping was very different. My mom commented that the blueberry flavor really surprised her, as she too envisions flan with caramel. Though I would still opt for creme brulee, Alton has redeemed flan for me. The texture was smooth and silky, and the flavor was creamy, sweet, and slightly eggy. There is a pretty good chance that I will make this again in the future, though I will make Alton’s caramel sauce next time. 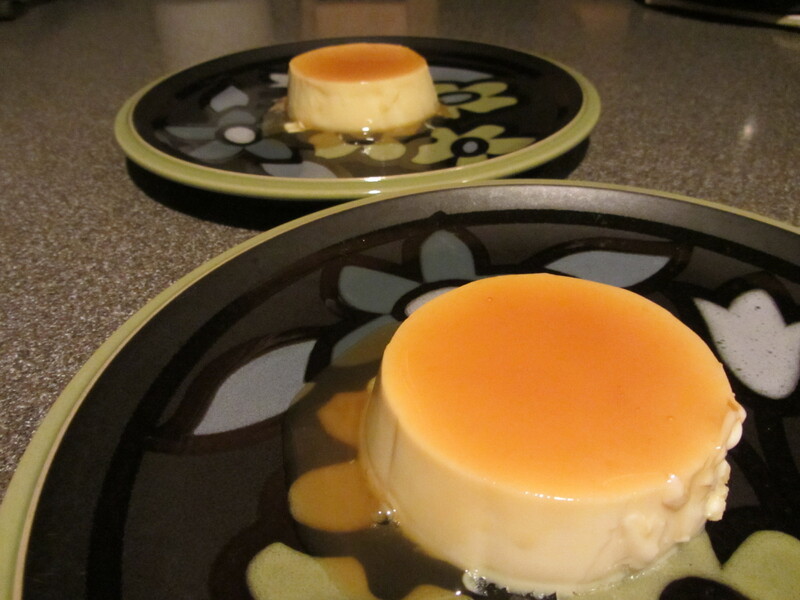 If you are a flan fan, you likely would think this recipe is flantastic! Okay, that was bad.